Belinda started Blue Ribbon Designs in early 2004, specializing in original counted-thread cross-stitch designs, specialty hand finishing of needlework smalls, and teaching handwork techniques across the country. She regularly appears in national publications and her cross-stitch charts can be found in needlework shops worldwide. Belinda has a passion for anything done with a needle and thread, and many afternoons, you can find her in her home-based studio, playing with fabric and threads, sketching, sewing, quilting and machine embroidering. You can see Belinda's inspiring work on her website www.BlueRibbonDesigns.com. Displaying 1 - 1 of 1 classes(s) found. 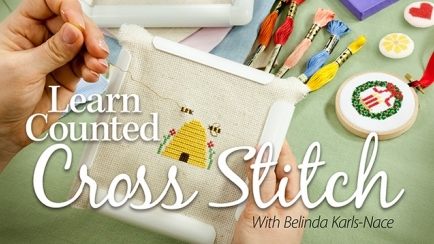 Learn how to work beautiful, counted cross stitch while stitching five exclusive projects included with this video class!